A buffeting sequence of dramatic monologues that provoke and disturb, Larissa Szporluk’s Traffic with Macbeth evokes a dark world linked to the black magic of Shakespeare’s tortured Scottish assassin, usurper of kings. Baroque in their sweep of high style and low slang, melody and dissonance, these poems use shifting animate and inanimate speakers and surrealist leaps to convey human brutality, the vulnerability of women and children, madness, and the struggle to escape the limitations of this world. Once at war, always at war. blows its fuse and bursts. still break with my bucking wave. and we’d all sign the dotted line. while I plowed the freaking acre. but viva, I’m on fire, I’m the rage. Larissa Szporluk was raised in Ann Arbor, Michigan and received her BA from the University of Michigan. 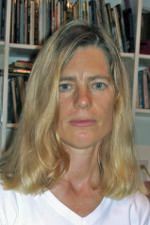 She studied at the Iowa Writers’ Workshop and received an MA in Literature at the University of California Berkeley, and an MFA from the University of Virginia where she was a Henry Hoyns fellow. She began her full-time teaching career at Bowling Green State University in 2000 and has since become an associate professor of Creative Writing and Literature. In 2005, she was a visiting professor at Cornell University. She is the author of four previous books of poetry: Embryos & Idiots (Tupelo, 2007), Dark Sky Question, winner of the Barnard Poetry Prize (Beacon Pres 1998), Isolato, winner of the Iowa Poetry Prize (Univ of Iowa, 2000), and The Wind, Master Cherry, The Wind (Alice James Books, 2003). Her work is included in Best American Poetry 1991 and 2001, New American Voices, and numerous other anthologies. In 2003, she received a National Endowment for the Arts grant to work on Embryos and Idiots.